In 1948, the USC Board of Trustees approved an updated version of the university seal. In this version, the poppies appear next to the shield inside the outer band, which is now formatted as a scroll. The Latin motto is inscribed on a separate scroll at the base of the seal. This seal continues to be the imprimatur, or official signature, of USC to this day. The medallion of office is worn by the president over his official regalia at ceremonial occasions. It was created by Associate Provost Jerome B. Walker for the inauguration of President James H. Zumberge on May 10, 1981 to serve as a tangible symbol of the authority vested in the president by the Board of Trustees. For his 1991 inauguration, President Steven B. 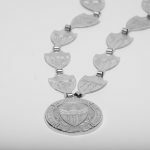 Sample asked Dr. Walker to design the ­medallion’s current chain, which consists of shields identical to that found in the university seal, linked together 16 times. 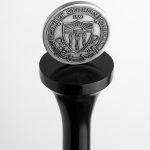 The front of the medallion depicts the university seal in full, and the back lists the name of the current president and the date of his inauguration. Each president keeps his medallion after retirement. For his 2010 inauguration, Dr. C. L. Max Nikias directed that two copies of the medallion be created. One copy will be worn by the president at appropriate events, while the other will be displayed in the Office of the President. The displayed medallion will include the name of each of the past presidents of USC engraved on the links of its chain. The mace of the University of Southern California is a ceremonial scepter symbolizing the authority of the Office of the President. The President of the Faculty has the honor of serving as mace bearer in all academic processions for commencements and other official university ceremonies. Historical maces date back to the 13th century when they were first carried as ceremonial symbols of the royal authority at events attended by English kings. The university mace was first used at the inauguration of President Norman Topping on October 28, 1958. 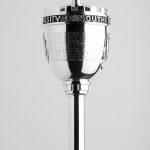 The mace was designed and crafted by the renowned master silversmith, USC alumnus and professor emeritus Hudson Roysher. The head of the mace depicts the university seal. Encircling the head of the mace is the hand-engraved inscription, “1880 University of Southern California.” The names of the past 11 presidents are engraved on the bowl. The crowning ornament is a depiction of the walled city of Troy. The mace is permanently displayed in the Office of the President. Designed for the inauguration of Dr. C. L. Max Nikias as 11th president of the university, a baton is ­carried by every marshal in the official procession. The batons are carved from walnut, with the university seal mounted in gold at the top. The fluted shape of the baton evokes the torch of learning, which is also found on the university seal. At the University of Southern California, marshals are traditionally chosen from the ranks of the ­faculty to lead the student procession at the New Student Convocation and Commencement. The ­University Marshal and the President of the Faculty march at the head of the procession. The cardinal robes of office worn by university trustees were designed by Dr. Jerome B. Walker for President Steven B. Sample’s 1991 inauguration. Reminiscent of the university’s doctoral gowns, the trustee robes feature red velvet front panels and chevrons on the sleeves. Bright gold piping outlines both the panels and the chevrons. Each of the front panels features an embroidered shield on the lapel, taken from the university seal. The trustees wear a doctoral hood lined with USC’s traditional gold satin with a cardinal chevron. The hood has a red velvet collar representing the university, in place of a faculty color representing a single discipline. 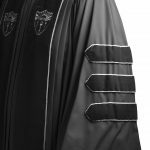 The University Marshal wears a special gown that serves as a bridge between the trustee robes and the university’s doctoral gown, with the university seal embroidered on the lapel.